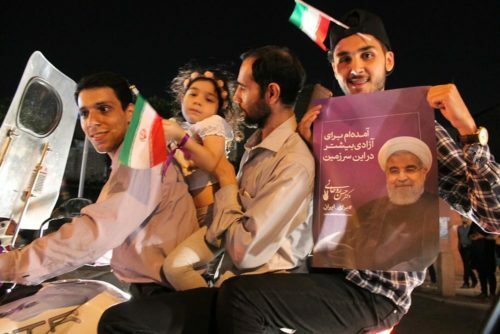 In the current media build-up against Iran it is easy to get lost in the confusion and hype about the Iranian government and miss out on an understanding of the problems facing the Iranian people and how they are coping with them. The current economic situation is worsening as the UN Security Council, the United States and the European Union imposed sanctions on Iran begin to bite. Major sectors of the Iranian economy have been affected such as the energy/petroleum industry, banking, the Central Bank of Iran, shipping, insurance, international trade and foreign firms dealing with Iran. In addition to these problems there is a shortage of fresh water, a problem associated with climate change as drought and rising temperatures put stress on existing reserves. Other environmental issues include vehicle emissions, refinery operations, and industrial effluents which have made Tehran one of the most polluted cities in the world. Even under so much pressure from so many different economic, environmental and international stresses the Iranian people have managed to maintain their dignity and famous hospitality as I found out traveling there last year. I was invited over for a conference for five days but ended up staying for five weeks, traveling north, west, and then south of Tehran. I took a train north to Tabriz and then on through the mountains to the border of Armenia and similarly west through plains to the mountains on the Turkish border. But it was in Tehran and in the south to Isfahan and Shiraz that I had most of my experiences meeting Iranian people. Everywhere I went – restaurants, cafes, galleries and on the streets – people approached me to practice their English and make friends. 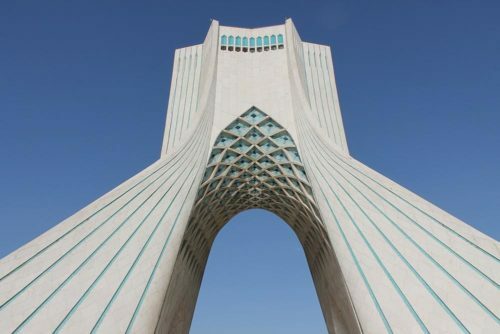 There are many interesting places to see in Tehran; e.g., the 435-meter-high Milad Tower which was completed in 2007, the more recent 270-meter pedestrian overpass of Tabiat Bridge (2014) and the Azadi Tower, the 45-meter-high marble-clad monument commissioned by Mohammad Reza Pahlavi, the last Shah of Iran, to mark the 2,500th year of the foundation of the Imperial State of Iran in 1971. The latter is surrounded by about 4 or 5 lanes of traffic but can be negotiated like most streets in Tehran by raising one’s hand Moses-like and parting the traffic. ​I happened to arrive on 19 May 2017 during the presidential election campaigning between incumbent president Hassan Rouhani (MDP – Moderation and Development Party – a pragmatic-centrist political party) and Ebrahim Raisi (CCA – Combatant Clergy Association – a conservative organisation). Out on the streets of Tehran campaigning between opposing groups with posters of their respective candidates was generally by young people and mainly good-natured. While I was advised not to go out on the streets at night, I found the street campaigners to be very friendly and they in turn advised me to be careful with my camera and not to take photos of police and soldiers which could result in confiscation (especially as I did not have a journalist visa). During the polling I visited two polling stations and was offered tea and invited in to sit down and observe the electors queuing and voting. Outside I made some conversation with the armed soldiers guarding the station who were also friendly and quite relaxed. After the voting took place, the twelfth such election in Iran, Rouhani was re-elected for a second term. Again the streets filled up with people and cars coming to a standstill for the celebrations. He received 23.5 of 41 million votes counted and was inaugurated on 5 August 2017. Soon after I visited various historical and cultural sites in Tehran. In terms of recent history it is interesting to visit the former Embassy of the United States, the site of the Iran hostage crisis in 1979 and which is now a museum. One of the best known historical sites in Tehran is the Saadabad complex that covers an area of 110 hectares and is located at the northernmost part of Tehran. It has 18 palaces which belonged to the royal families of Qajar and Pahlavi in a beautiful garden. Reza Shah of the Pahlavi Dynasty lived there in the 1920s, and his son, Mohammad Reza Pahlavi, moved there in the 1970s. After the 1979 Revolution, the complex became a museum. I also visited the National Museum, the Museum of Contemporary Art and Honarmandan Park (Artists Park) learning about a wide range of past and present Iranian culture. Honarmandan Park has the Iranian Artists Forum which is a set of galleries located inside the park along with a vegetarian restaurant, a theatre and outdoor sculptures. Here I met 2 Iranian artist sisters who discussed with me the difficulties they encountered trying to show work abroad. Both are now in Canada, at least temporarily. During the day the streets were quiet as it was the Holy Month of Ramadan (May 27 to June 25, 2017) but in the evening, after sundown, the city came alive as people went out to the cafes and restaurants or to picnic in the parks. I got to know a regular taxi driver, Ahmed, and his English-speaking son, Mojtaba, who brought me to Mount Tochal, a mountain and ski resort located on the Alborz mountain range, close to the metropolitan area of Tehran. Mountain climbing is very popular in Iran (another Iranian acquaintance of mine from Mashhad lost 9 friends in an avalanche last December). Life is tough for a taxi driver in Tehran with so much air pollution and traffic, one of the downsides of having cheap petrol. Ahmed and his wife lived in an apartment in Tehran along with Mojtaba, a languages student who hopes to continue his studies in Germany. On one taxi journey to the National Museum, Ahmed passed me back a dinner his wife had made for me as he knew it was difficult to get food during the day during Ramadan. When I decided to go south, Mojtaba helped me to get train tickets to Isfahan. Iranian trains are slow but comfortable and are a great way to see the countryside. Mojtaba came down to Isfahan with me for the day and we were met in the train station early in the morning by Atefah (just graduated from art college) and her sister (medical student) and their mother who had invited me to stay with them through the Couchsurfing website. During the day we went to visit Chehel Sotoun (“Forty Columns”), a pavilion in the middle of a park at the far end of a long pool. It was built by Shah Abbas II to be used for his entertainment and receptions and beautiful paintings of such scenes adorn the walls of the pavilion. Later we went for a picnic at night in Naqsh-e Jahan Square (Imam Square), the jewel in the crown of Isfahan architecture (constructed between 1598 and 1629) and a UNESCO World Heritage Site. 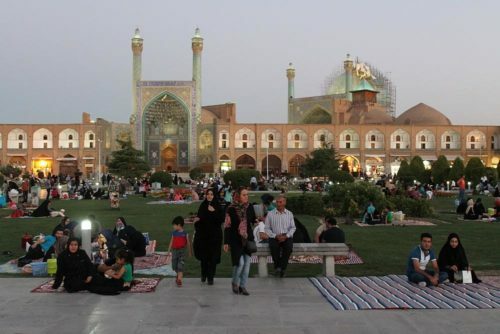 The square is surrounded by buildings from the Safavid dynasty, one of the most significant ruling dynasties of Iran, often considered the beginning of modern Iranian history. Around a thousand people sat around with their families on rugs and enjoyed picnics. Atefah’s mother also laid out a picnic while Atefah rushed over to two foreigners whom she had spotted to ask them to join us. Turned out to be an Australian mother and son who were traveling around Iran together. 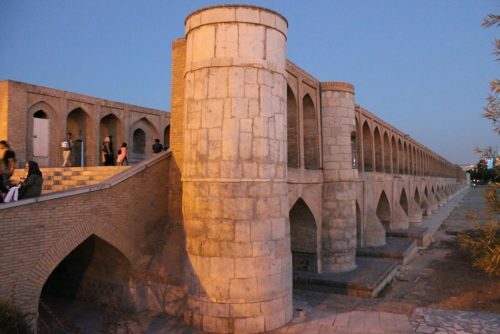 We were all taken off to see some of the famous Isfahan bridges over the Zayandeh River which was completely dried up at this time of the year. We visited the Si-o-se Pol pedestrian bridge which was built in 1632, the Joui pedestrian bridge built in the 17th century, the Khajou pedestrian bridge (1650), and the Marnan pedestrian bridge (1599). In conversation with Atefah, she told me that the water shortages have become so serious that they have water only 4 days a week at home now. Iranian meteorological services say that 97% of the country is affected by drought but it is particularly bad around Isfahan where demonstrations have broken out over water in the past. She also said that foreign goods are becoming more and expensive and the inflation rate is around 10%. She is trying to go to Germany for further study and says that the decreasing grants and the worsening exchange rate is making it increasingly harder for her to get the visas necessary. The next night I was brought to hospital by Atefah’s family due to dehydration as I had not been drinking enough water. I dreaded going in as I was used to very long waits at home. However, I was seen very quickly and was soon moved to a cubicle and put on a drip. After about three hours I was released and brought to an overnight bus I had booked to Shiraz. Couchsurfing again I stayed with Mohammed and his family. Over the next couple of days he showed me around Shiraz and then drove me to Persepolis, the ceremonial capital of the Achaemenid Empire (ca. 550–330 BC). It is situated 60 km northeast of the city of Shiraz and is also a UNESCO World Heritage Site. Persepolis is believed to have been a grand ceremonial complex but only occupied seasonally. Mohammed also talked about similar problems regarding water, inflation and food prices. At this time in June the temperatures in Shiraz were nearing 40 degrees. That same week the temperature in the southwestern Iranian city of Ahvaz (between Isfahan and Shiraz) soared to 53.7 degrees (29/6/2017), Iran’s highest temperature ever recorded and the highest June temperature in Asia on record. I decided to fly back to Tehran and stay in a hostel for the last night. I arranged to meet Ahmed and Mojtaba in a cafe to drive me to the hostel. Upon inquiring if they knew where the hostel was they answered in the affirmative but that they had already decided that I was going to be staying with them instead. And so I was taken off to their apartment to meet Ahmed’s wife, have dinner, a last walk around Tehran streets and then given Mojtaba’s bed while he slept on the couch. In the morning we arose and they brought me the 40 kms to Imam Khomeini International Airport for my flight home. 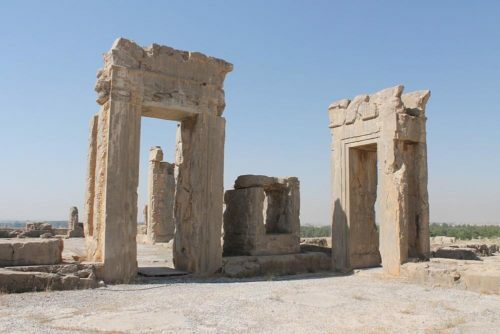 This article was posted on Friday, July 6th, 2018 at 7:24pm and is filed under Iran, Media, Sanctions, UNESCO World Heritage Sites, United Nations, United States.